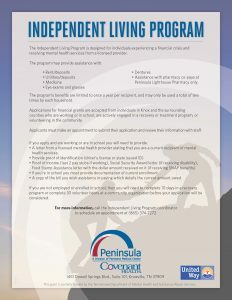 Contact the Independent Living Program by calling (865) 374-7272. Assistance may be provided for utilities, rent, medications, auto repairs and other needs based on exceptions made by the program director. Download our flier here for complete details. Contact the Independent Living Program by calling (865) 374-7272. This grant is supported by United Way and the State of Tennessee Department of Mental Health and Substance Abuse Services.